Roundabouts are successfully used all over the world, by millions of people every day; however, the appearance of roundabouts in our province over the last ten years has given rise to countless questions on how to use them properly. Because our goal here at TranBC is to help you understand the why and the how of transportation in British Columbia, we reviewed your most frequently asked roundabout questions and collected the best answers. In a multi-lane roundabout which lane should I be in? Typically, you should look at a roundabout as they would any other signalized intersection. Would you turn left from the right lane at a signal? So, if you want to turn left, the left lane is where you want to be. Another important rule to remember is that you should never change lanes within a roundabout. Instead, look at the signs (and pavement markings) in advance that show which lane to use. Pick the correct lane in advance of the roundabout and follow it through. You choose your lane in a multi-lane roundabout the same way you would in a traditional multi-lane intersection. To go straight or right, get in the right lane and to go straight or left, get in the left lane. Should I signal when I enter the roundabout, when I exit the roundabout or both? Signals are great things and we are obviously big fans. This lets drivers waiting to enter the roundabout and pedestrians waiting to cross, know your intentions. Do I stop for pedestrians in the roundabout? Yes. 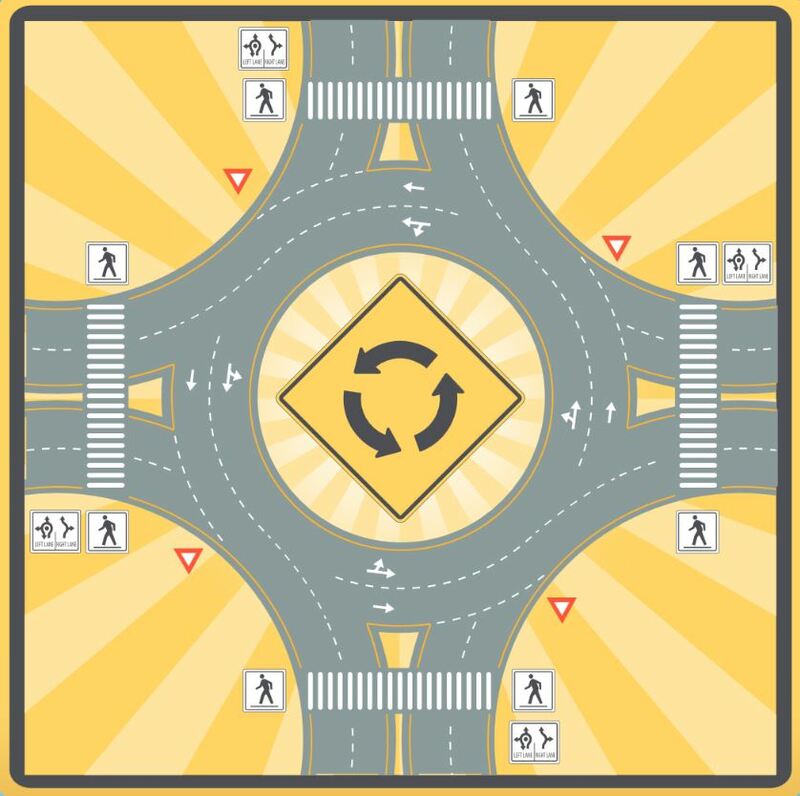 If you look at the image above, you will see that pedestrian crosswalks are actually located outside of the traffic circle itself (approximately one car length outside of the roundabout). If you are a pedestrian crossing the roundabout, always use the marked crosswalks. Just like crossing any road, wait for a gap in traffic, or until all vehicles are stopped. Don’t cross to the centre island. How do bicycles fit into the picture? Use a separated cycling pathway. Prior to the roundabout, exit the bike lane and share the pedestrian pathway with pedestrians. Reduce your speed and be aware of pedestrians when entering onto and travelling along the pathway. Dismount and use the marked crosswalks to cross the intersecting streets, as a pedestrian would and then exit the raised pathway at the ramp that leads down to the bike lane or shoulder of the road. Roundabouts. The very mention of this word can create panic and confusion in some drivers’ minds. But it doesn’t have to! We hope this has helped to clarify any confusion. If you’d like to find out more, we’ve got a useful roundabouts page you might want to have a look at. It’s loaded with information, including animations and video that shows exactly how roundabouts are used. ICBC’s guide to roundabouts is also a great resource. Any questions we haven’t answered here? Leave your question in the comments below. Happy trails! Roundabouts are great but the signage is a mess. Traffic in the outer lane needs to yield at each exit to traffic on the right, and the signage should reflect that. Imagine two cars going straight through, one enters in the inside lane from 9 and wants to exit at 3, the other enters the outside lane at 6 and wants to leave at 12. If they end up beside each other at 3, there’s a good possibility they’re going to be a conflict. They’ll each be following the signage, but the inside car will want to exit and the outside car will want to go straight through. The signage should say that the inside car has right of way to exit at any point, and the outside car has to yield unless exiting. That, and the whole “signal on approach” thing is unneeded and confusing. Some cars signal right because they’re taking the first exit, some signal right no matter what exit they plan on taking. Some don’t signal because they don’t care, some don’t signal because they’re going straight through. When I approach, I don’t have any need to know when the car in front of me is going to exit. I probably won’t even be behind him when he does. If he signals to the right just before his exit, that’s all I need to know. Trying to get everyone to signal is a waste of time when most people don’t even know if the inside or outside lane has right of way in situations where they want to cross over each other. Oh…and one more thing…. “traffic circles” which apparently you have to yield to traffic in the circle and traffic to the right… in other words, you have to yield to traffic in both directions… how the hell is that supposed to work? They should have the same simple rule as roundabouts… yield to cars in the circle. Just adding my voice to those already here. I often encounter roundabouts in Vancouver and 9 times out of 10 I meet with someone using it incorrectly, leading to frustration or near miss accidents. Coming from England I am well used to roundabouts and the rule there is “Slow down or stop, look, give way to traffic on the right” This of course translates to “Give way to traffic on the left” here in Vancouver. Often when I reach a roundabout and give way to the person on my left, they stop in the roundabout (!) and wait for me to proceed, sometimes they even wave me on, occasionally with foul language and rude gestures, even though they have the right of way and are holding me up! Alternatively, when I am driving about the round about, someone will just drive full speed into the roundabout necessitating me to slam on the breaks. At each roundabout there is a sign indicating the direction that a vehicle should go around. It would be beneficial to add the simple rule “Give way to traffic on the left”. This would make roundabouts much more effective and less dangerous. I agree that the advice to “Give way to those already in the roundabout” is confusing and unhelpful if two vehicle arrive at the same time. This is especially confusing if the roundabout is small, and if one or more of the cars is driving too fast. Often cars don’t slow down at all when entering a roundabout. A media / radio campaign like the ones about not driving while using cell phones or not tail gating would also help. Thanks for this insightful comment Stella. We agree that confusion can make this a frustrating experience. This is a relatively new concept to many drivers and education is key.We have created this content and promote best practices online as well to help educate the travelling public on this. We are also working with ICBC to further clarify the language in their instructional booklet. If two or more vehicles approach the roundabout at the same time, which vehicle has the right of way? Thanks for connecting with us here. The golden rule of the roundabout is to yield to traffic already inside the roundabout. In your scenario there are no vehicles inside the roundabout. So, if two or more vehicles approach the roundabout at the same time (and are moving at equal speed) they should be able to enter the roundabout at the same time. Make sense? If one of those vehicles enters the roundabout before the other – the vehicle that is in the roundabout has the right of way over the one waiting to enter. This is a single lane rounderbout. Should I use the left hand indicater when going round a rounderbout until I reach my right turn, then indicate right. Yes, Paul. Signalling left until you reach your exit lets other drivers (particularly those waiting to enter the roundabout) know you are continuing through. The lane dividing line marks (broken lines throughout) of this blog diagram do not agree with those at http://www.th.gov.bc.ca/roundabouts/documents/multi-lane_signs_and_markings.pdf. The latter markings provide better guidance to drivers. Please correct the blog diagram to reduce confusion. We are sorry for the confusion. We spoke with our traffic engineers who informed us that the province is moving towards the model with the broken lines throughout to prevent drivers inside the roundabout from making dangerous lane changes at points of entry. The best case scenario is still for drivers to choose the lane they want to use before they enter the roundabout, so that they do not have to change lanes while they are inside it. Hope that this helps! I am from Australia where Roundabouts are used very successfully. The single biggest reason for this (in my view) is that people understand and abide by the most fundamental rule “Give Way to the car on your Right”. This would translate to “Give way to the LEFT” in Canada. The Canadian rule of “Yeild to traffic in the circle” is actually much more confusing than it needs to be. When two (or more) cars approach a roundabout at the same time in particular on smaller roundabouts, chaos ensues. I experience this everyday on my commute and it has become very obvious that if people adopted the “Give way to the LEFT” rule that the same sort of seamless flow would occur as seen in more roundabout savvy countries such as Australia and the UK. I recommend you go to a neighborhood roundabout during school drop off and you’ll see what I mean.. Thanks for your comment, we have shared it forward with our traffic engineers for review. Perfectly put, coming from England could not agree more. It’s not just the school run its all the time, and if you actually look at the drivers (& cyclists) eye line they don’t even look to the left, actually don’t look anywhere other than the way they want to go. Not sure if this is ignorance, entitlement, or just good old fashioned stupidity? Either way completely defeats the object of rondabouts as either people drive straight through and create road rage, or stop needlessly and causing confusion and delay. What’s worse is that on the City of Vancouver’s own website they say give way to the right. Completely wrong or is this because the average Vancouverite can not differentiate between a round about and a 4way stop they replaced? So further confusion, adding to already inadequate driving skills of the drivers in Vancouver, no wonder there are 2800 incident calls to ICBC every day! How do tractor trailers fit into a roundabout? Great question. Modern roundabouts are constructed with “truck aprons” – an additional concrete hip around the centre circle. These aprons give large tractor trailers the extra space they need to take the tight corners found inside the roundabout. This is excellent. I would suggest that this information be available to the local Block Watch and community groups through the RCMP connection as the roundabouts are a concern for all drivers. The video also talks about the cyclists and pedestrians, which I have not heard explained so well.